A routine training exercise in the Louisiana bayou becomes an all too real war of attrition when a unit of brash National Guardsmen unwittingly upset a group of Cajun hunters. Lost in unknown territory and armed with little more than blank ammo, the part-time soldiers face a terrifying battle for survival against an unforgiving enemy hidden deep in the heart of the swampland. From Walter Hill, the director of The Driver and The Warriors, Southern Comfort remains one of the key cult films of the 80s, Boasting a stellar cast that includes Keith Carradine (Nashville, The Duellists), Powers Boothe (Sin City, Avengers Assemble), Fred Ward (Tremors, The Right Stuff), Franklyn Seales (The Onion Field), T.K. Carter (The Thing), Peter Coyote (E.T.) and Brion James (Blade Runner, The Player), the film also features a killer soundtrack by Ry Cooder. 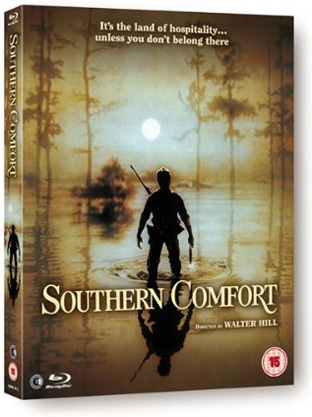 Southern Comfort will be released on UK DVD and make its Blu-ray debut (with limited edition packaging) on 26th November 2012 from Second Sight at the RRP of £15.99 for the DVD and £19.99 for the Blu-ray. Extra features will include Will He Live or Will He Die?, a newly commissioned 45-minute interview with director Walter Hill.